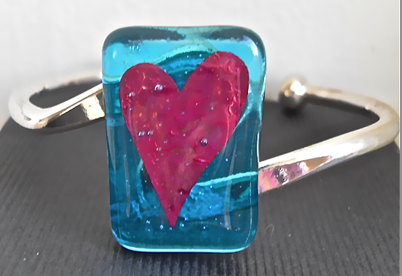 This very striking bangle has a glass centrepiece which is made of two pieces of 3cm x 2cm translucent Turquoise glass with a thin copper sheet heart fused inside. This is mounted onto a very good quality Plated Silver bangle which is adjustable and so should fit most wrists. It comes in a nice Silver card bangle gift box.